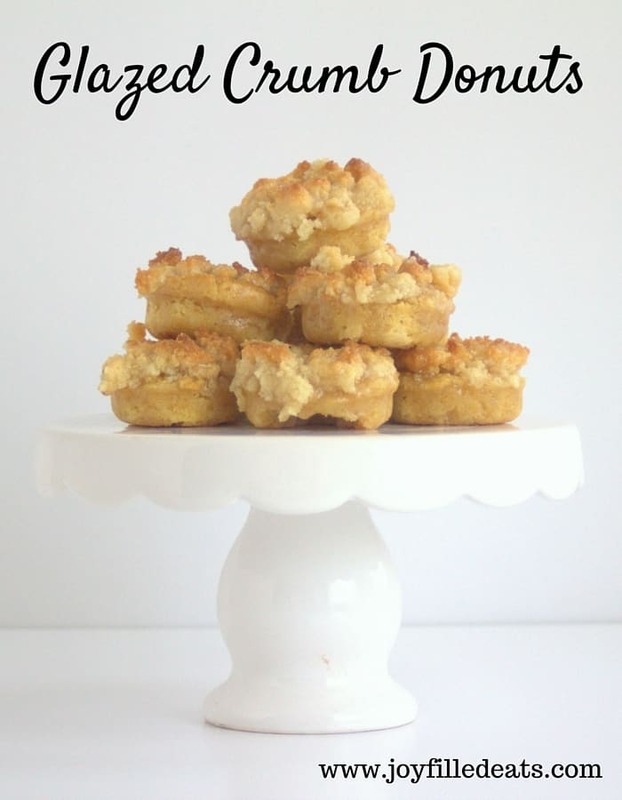 Moist cakey keto donuts topped with crumbs and covered with a sweet glaze. 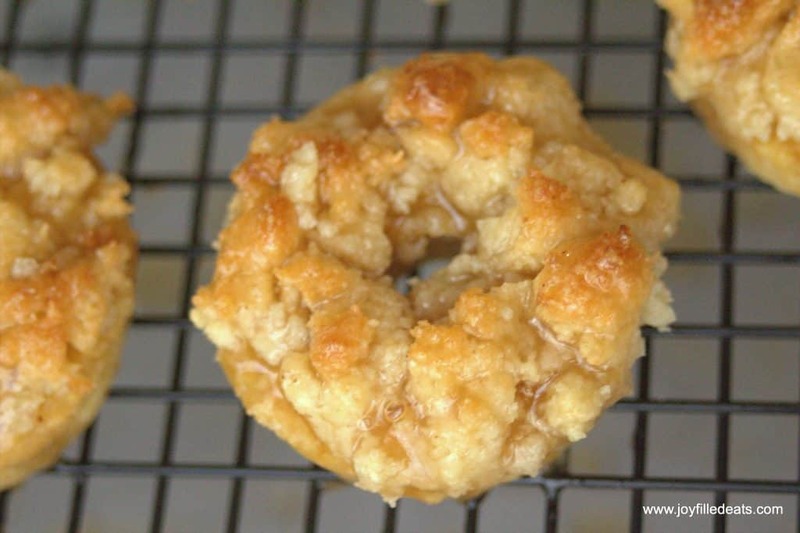 I wanted to make a copycat to the Entenmann’s Glazed Crumb Donuts but didn’t succeed. These are much better. I won’t be tempted to grab one of those boxed assortments anymore. After a few flops in the kitchen last week I was thrilled to nail these keto donuts on my first try. These are amazing. My husband enjoyed them and was disappointed I set some aside to take more photos of instead of just letting them all get devoured right away. And a friend who was over said she couldn’t believe how moist they were and loved the contrast between the donut and the crumbs. This is the donut pan I used. If you do not have a donut pan order one. Or just make the crumb donuts into little muffins. Having the hole in the center helps the dough to cook evenly though so I do recommend the investment. And just think of all the donuts in your future once you have a donut pan. Step 1: Put the batter in the donut pan. Step 2: Pile crumbs on top of each donut. Step 3: Bake until golden brown. Step 4: Pour the sweet, sticky glaze over the donuts. 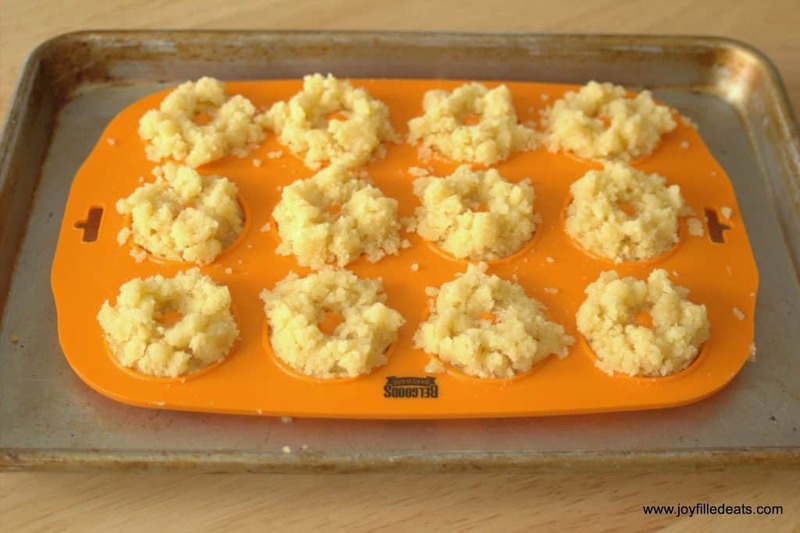 Step 5: Try to share these amazing glazed crumb keto donuts (as much as you don’t want to). 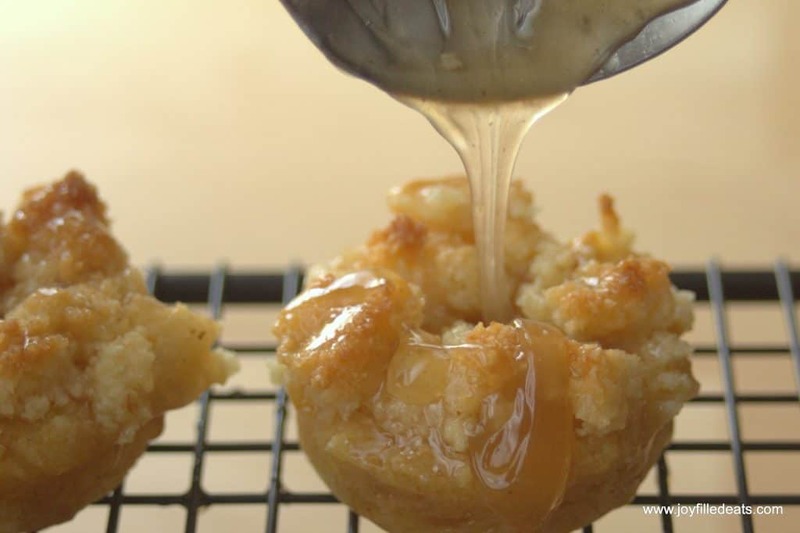 A moist cakey donut topped with crumbs and covered with a sweet glaze. 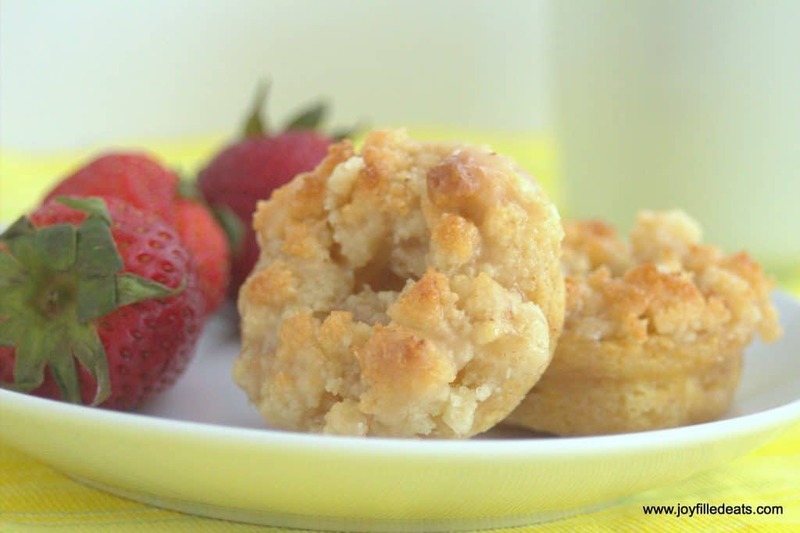 I wanted to make a copycat to the Entenmann's Glazed Crumb Donuts but didn't succeed. These are much better. I won't be tempted to grab one of those boxed assortments anymore. Combine all the ingredients for the batter and mix well. Divide between twelve mini donut molds. 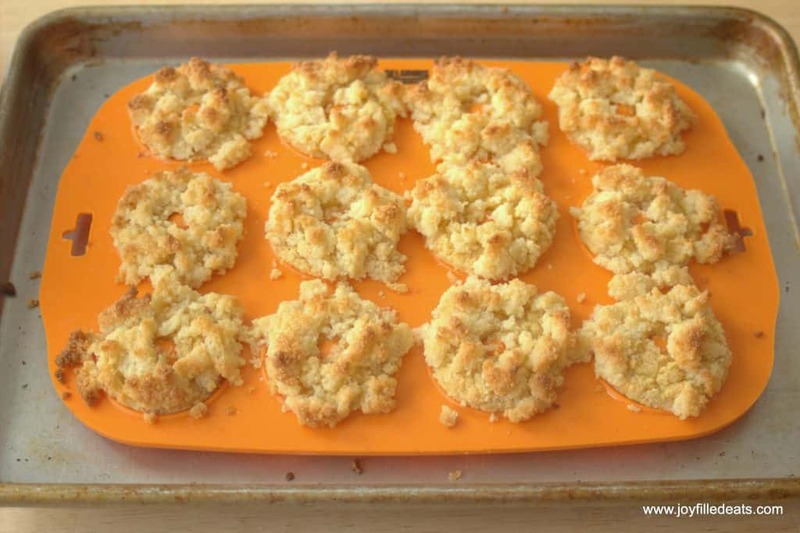 Combine the ingredients for the crumbs and mix well. They will be large moist crumbs. Spread them with your hands on top of the donut batter. You may need to break apart the large pieces into smaller crumbs. Bake for 25 min. If the crumbs start to get too brown you can cover them with foil. Meanwhile, make the glaze. In a small saucepan over low heat melt the butter and sweetener. Cook on low, whisking occasionally, for 12-15 minutes until golden. Cool for at least 10 minutes. Keep whisking occasionally as it cools to avoid it separating. Cool the donuts and put them on a wire rack. 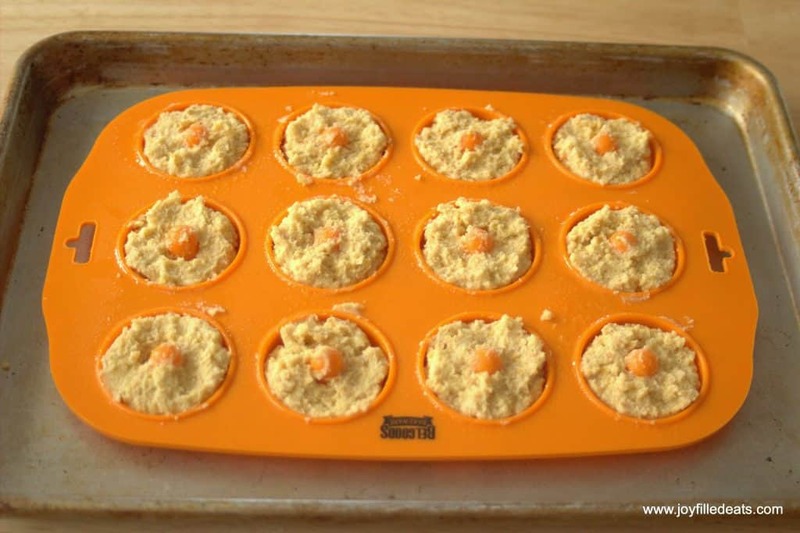 Put a clean rimmed baking sheet under them. Spoon the glaze over the donuts. Then scoop up the glaze that dripped off onto the baking sheet and spoon it on them again. Repeat. This helps them get a nice thick coating. You will notice that the glaze keeps thickening. Yes. Swerve should work. You will need about 1.5 times the amount listed because it isn't as sweet. Could you use just erithritol or monk fruit vs those blends? I don’t really want to buy something else when I already have those 2 in my pantry! Do you mean a monk fruit blend like Lakanto? I think that would work better than erythritol. Erythritol on its own can have a cooling effect. I would literally eat the whole pan of these!!! I love that they are low carb and gluten free donuts!! I'm on the Keto diet and this is just what I needed today, THANK YOU! I made these today and what a mess! Only 3 donuts in a Wilton 6 donut pan. I had more crumb mixture than donut mixture. If it only makes three, that greatly increases the macros. Hi Debbie, I'm not sure why you only had enough batter for 3 full sized donuts. I use a mini donut pan and get 12 mini donuts. I am not familiar with the Wilton 6 donut pan. 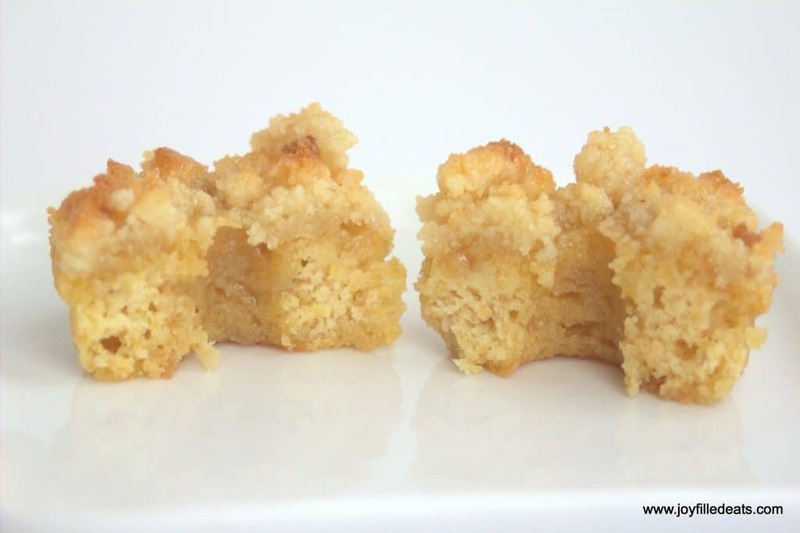 This recipe is heavy on the crumb topping because that is the best part in my opinion. I hope they were still tasty! Hi Taryn, I wonder if these would work in a mini donut maker? I bought a donut pan but it is for larger donuts. No, I don't think you could do the crumb topping in a donut maker. You could make them as bigger donuts in your donut pan or as mini muffins if you have that type of pan. Awesome recipe. I only have almond flour and coconut flour how much of each would I use if I wanted to omit the flax? 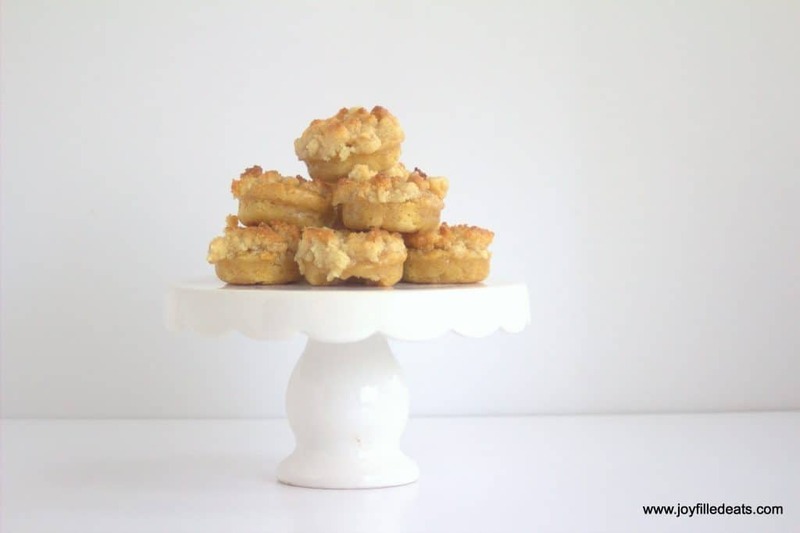 You can keep the amount of coconut flour the same and just replace the flax with almond flour. What can I use instead of a xylitol blend sweetener? I have dogs, and I refuse to have it in the house. An erythritol stevia blend should work. Use one that is twice as sweet as sugar or you will need to increase the amount. I have all 3 of the flours for this recipe. 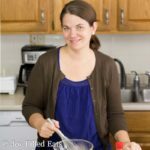 How much of each can I use instead of the baking mix? I don't want to buy the blend. You need 1/2 cup total which is 2.66 tablespoons of each. Could you use vegan butter and get a good result? My daughter is vegan, and trying for a keto vegan lifestyle. Hi Jill, I've never used vegan butter before so I'm not sure. I do use butter flavored coconut oil pretty frequently and I think that would work. My oldest son loves these! So do I! Oh my goodness! So good! I made these at 6:30 this morning and when my son dropped of the baby I gave him warm donuts! He was diagnosed with celiac disease, a few weeks ago and donuts were his fav food. His eyes got so big this morning when he heard gluten free! Thanks! 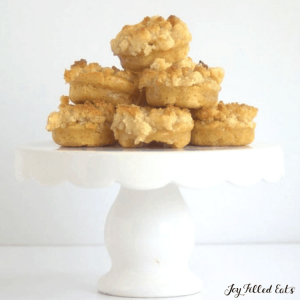 I have to try the other donut recipes you have too! On the original recipe carb net was 1 per Mimi donut. When I saved it, carb count rose to 4 per mini donut.......how did that happen? What is the correct net carb count?????? 1 carb is correct. I just added this to MFP to double check. Some recipe calculators don't know to subtract sugar alcohols and fiber to calculate net cards so that is probably where the discrepancy comes from. thank you for all you do! is there anyway to just use almond and coconut flor but not flax? Yes, I would use 2/3 almond flour. Increasing the coconut flour may make the batter too dry. Hi, so does this mean use two-thirds almond flour to one-third coconut flour, equaling 1/2 cup of the two together? Thanks! Could ground chia be substituted for the flax or would you recommend just using the almond flour if flax is not available? I have never used ground chia before so I'm not sure if it would work in this recipe. I would suggest just using additional almond flour but if you try the chia please come back and let me know how they turn out. OH MY GOODNESS!!! Pretty sure these are my new favorite treat!!! Forget breakfast! They are perfect for ANYTIME!!! They are fantastic!!! I cooked the glaze a little longer to make it darker/more caramel colored and added about 1/4-1/2 tsp vanilla after cooking and made it tasted like caramel and holy smokes were they good...i had to get out of the kitchen or i think i literally would have eaten all 12...that's a first for me...most of the time keto/low carb treats are "a nice break from the norm" but they never make me want to eat and eat (it's a texture thing - not a huge fan of our flour options) but these were PERFECT!! LOVE!! I will most definitely be making these again!!!! THANK YOU!!! Thank you for your great review :) I'm so glad you liked them! Any way to make these without xylitol because i have dogs..?? I just added it to the recipe. Oh my!!! Only 1 carb per donut! That's awesome! Thank you!! I just made these today! YUM! I have a heart-shaped, 6 donut pan. It made 4 of them. I ate 2 . . . I am FULL and they were delicious! My daughter, who doesn't do THM likes them as well! WIN-WIN! They were delicious! I subbed the baking blend for the thm baking blend and the sour cream for Greek yogurt. They really do taste like sugar filled treats. Can you use a mini donut maker? You could if you left off the crumb topping. But that really is the best part. Serving size for an S? Probably two for mini donuts and one if you make full size. Has anyone made these using the THM baking blend? That's all I have on hand...I don't have the stuff to make this baking blend ? You should be able to sub the THM BB. I know some ladies have used it in my lemon blueberry donuts successfully. They tasted so good, I guessed on baking temp, did them longer as I had a reg size donut pan put a little less sweet blend and half the glaze. My THM support group just loved them so did I.
I don't have a mini donut pan, just a regular size donut pan. Could I use that? How would that change things? Baking time etc? You will only get about six donuts and the baking time will probably increase by a few minutes. Just bake until they are golden brown. Oh my yum! My sister and I just made this and we stopped talking while we consumed them and instead just made happy eating noises. Oh my yum! My mom didn't believe it was low carb and sugar free. I was the lucky one to clean up afterwards and I must admit, I licked a few utensils I don't normally. I just couldn't help myself. How could I just wash that dot of yummy down the sink?!! I didn't see a temperature to bake it. They look delicious! 350. Sorry! Just edited the post. I'll edit the printable recipe tomorrow.